Chatrium Hotels : Hot Deal with Breakfast at Emporium Suites from THB 4,871, Thailand. For guests who knows exactly when you will travel and you need a good night�s sleep in a great room with breakfast the next morning at Emporium Suites by Chatrium. Package Inclusions: Welcome fruits upon arrival. Complimentary daily buffet breakfast for up to 2 registered guests. Complimentary usage of fitness and pool. 20% OFF from the food bill in METTA Eatery & BAR at Maitria Hotel Sukhumvit 18. Complimentary WIFI throughout the hotel. 15% discount on regular priced SPA packages at THANN Sanctuary & SPA. Terms & Conditions: Booking and staying period from now until 31st October 2017. The reservations are subject to the space availability. Super Deal At Chatrium Hotel Royal Lake Yangon From USD 131.58, Myanmar. Take advantage of our remarkable Super Deal Campaign and receive exclusive rates for your stay. Package Inclusions: Complimentary daily buffet breakfast for up to 2 registered guests at �The Emporia�. Welcome fruit and fruit plate replenished daily and flower on arrival. Complimentary in room Wi Fi or wired Internet access 1 IP per unit valid for 4 devices. Usage of Fitness Centre, Outdoor Swimming Pool. 20% discount on Spa or massage from the regular price at Nemita Spa. 5% discount on Food. 10% discount on Buffet dinner at The Emporia Restaurant discount on food only. Non alcoholic drink coupon for 2 guests at Lobby Lounge. Terms & Conditions: This offer is valid for booking and staying from now until 31 October 2016. Reservations are subject to space availability. Book Now & Save with Chatrium Residence Sathon Bangkok from THB 2,137, Thailand. Book Now & Save with Chatrium Residence Sathon Bangkok from THB 2,137, Thailand. Make the most of our Book New & Save @ Chatrium and get more during your remarkable stay at Chatrium Residence Sathon Bangkok. Package Inclusions: Complimentary in room Wi Fi and wired Internet access. Welcome drink upon arrival. Usage of Fitness Centre, Sauna and Jacuzzi. Complimentary daily shuttle van service to Chongnonsee Sky Train Station on Sathorn Road, Emporium Shopping Complex, Promphong Sky Train Station and Central Rama III Shopping Complex. 25% discount on Spa or massage from the regular price at Green Leaf Spa. 10% Discount on food only at Albricias Restaurant. Terms & Conditions: This offer is valid from Now 30th October 2016. Reservations are subject to space availability. Special Campaign at Chatrium Hotel Riverside Bangkok from THB 2,556, Thailand. Book and save with our limited time offer by taking advantage of one of the most attractive Bangkok hotel deals. Package Inclusions: Welcome assorted seasonal fruits. Welcome, drink voucher up to 2 registered guests, eligible to use at all available Food & Beverage restaurants. In room Wi Fi and wired Internet access. Daily scheduled Shuttle Boat Service between hotel and Taksin Pier. Light and Easy Luggage Service. Terms & Conditions: This offer is valid for booking and staying from now until 31 October 2017. Festive period blackout dates from 29 December 2016 01 January 2017. Chinese New Year period blackout dates from 26 January 2017 1 February 2017. Book Now. Enjoy Spring Special Packages with Great Extras Price Starting From USD 134.55 net. Chatrium Hotels: Enjoy Spring Special Packages With Great Extras Price Starting From USD 134.55 net. This spring, book Chatrium Hotels & resorts Spring special packages starting from USD 134.55 net and get some other great benefits: Welcome drink. Room Only with free wifi Daily full breakfast for 2 per. 15% discount at THANN Spa. Non alcoholic drink coupon for 2 guests at Lobby Lounge. THB 300 voucher eligible to be used on Hotel manage facilities. Free THB 500 F&B credit per room per stay etc.. Terms & Conditions: Offer valid for bookings and stay until booking & stay until 30th June, 2016 Chatrium Hotel Riverside Bangkok. Emporium Suites by Chatrium Bangkok. Offer valid for bookings until 31st May 2016 and stay until 30th June 2016 Chatrium Residence Sathon Bangkok. Maitria Hotel Sukhumvit 18. Chatrium Hotel Royal Lake Yangon. **Benefits may varies as per selected hotels. Special Campaign Room Offer at Maitria Hotel Sukhumvit 18 from 2253THB by Chatrium Hotels Bangkok. Book now and save more. With Special Campaign you can get great rates for a limited time only at THANN Sanctuary. Package Inclusions: In room Wi Fi and wired Internet access. Daily 2 bottle of water. Eco friendly amenities. In room Coffee & Tea facilities. Personalized services by Matria Host. 15% discount on Spa or massage. Grocery shopping service. Terms & Conditions: This promotion is valid from Now 31 October 2017. Offer is not applicable to following festive period of : * Christmas and New Year from 25 December 2016 5 January 2017 * Chinese new year from 27 January 5 Febuary 2017. Reservations are subject to space availability. The offer is valid only for Maitria Hotel Sukhumvit 18 . Book Now & Save on Rooms at Chatrium Residence Sathon Bangkok From 2234THB Bangkok. Make the most of our Book New & Save at Chatrium and get more during your remarkable stay at Chatrium Residence Sathon Bangkok. Package Inclusions: Complimentary in room Wi Fi and wired Internet access. Welcome drink upon arrival. Usage of Fitness Centre Sauna and Jacuzzi. Complimentary daily shuttle van service. 25% discount on Spa or massage from the regular price at Green Leaf Spa. 10% Discount on food only at Albricias Restaurant. Terms & Conditions: This offer is valid from Now 31 May 2016. Reservations are subject to space availability. Offer valid only for Chatrium Residence Sathon Bangkok. Celebrate Easter with Hotel Credit Up To 17USD Per Room!! Celebrate Easter with Hotel Credit up to 17USD Per Room Chatrium Hotels Thailand. Going to Thailand this Easter? Choose your hotel with Chatrium and enjoy complimentary amenities discounts and hotel credits up to 17USD hotel credit value may vary according to each Hotel. To know in detail all the discounts and special policies please check each hotel conditions. Coupon valid for the following hotels: Chatrium Hotel Royal Lake Yangon Emporium Suites by Chatrium Maitria Hotel Sukhumvit 18 Chatrium Hotel Riverside Bangkok Chatrium Residence Sathon Bangkok. Terms & Conditions: Booking period from now until 30th April 2016. Staying period starts from 18th March to 30th April 2016. Use promo code: EASTER. Enjoy Festive Deals With Chatrium Hotels At Emporium Suites By Chatrium, Thailand! Enjoy Festive Deals With Chatrium Hotels At Emporium Suites By Chatrium, Thailand. Festive Special Deal @ Emporium Suites. In room WIFI. THB 500 voucher eligible to be used on Hotel manage facilities. Early check in. Late check out. 15% discount at THANN Spa. T&C: Booking and staying period from now until 31st May, 2016. The booking should be cancelled at least 24 hours prior to arrival to avoid the penalty fee of 1 night accommodation. Enjoy Christmas & New Year with Complimentary Benefits by Chatrium Hotels, Bangkok. Enjoy Christmas & New Year with Complimentary Benefits by Chatrium Hotels, Bangkok. Enjoy a remarkable night in any of our rooms or suites and in the morning, enjoy a sumptuous complimentary breakfast at Chatrium Hotel Royal Lake Yangon. Package Inclusions: Complimentary daily buffet breakfast for up to 2 registered guests at �The Emporia�. Welcome fruit and fruit plate replenished daily and flower on arrival. Complimentary in room Wi Fi or wired Internet access 1 IP per unit valid for 4 devices. Besides all the above benefits included in this room rate, the below benefits are also additionally eligible to any reservations that are booked/made only from our Chatrium.com website. USD 17 per room per stay, only eligible to be used on chargeable Hotel managed facilities of F&B, Business Centre, Minibar and Laundry. Guaranteed early check in from 11 am and late check out until 3 pm. 20% discount on Spa or massage from the regular price at Nemita Spa. 5% discount on Food & Beverage. 10% discount on Buffet dinner at The Emporia Restaurant. Welcome drink upon arrival. T&C: This offer is valid from 24 December 2015 - 3 January 2016. Reservations are subject to space availability. Book Now. Limited Time Deal Get 15% Discount on Spa. Limited Time Deal Get 15% Discount on Spa and Complimentary in room wifi with Emporium Suites, Chatrium, Bangkok, Thailand. Limited time only. Book now for a room with special rate including 5 star accommodation, remarkable service and many more benefits. Offer includes: Welcome drink upon arrival. Complimentary in room Wi Fi and Internet access 1 IP/user/per stay. THB 500 voucher per room per stay, only eligible to be used on Hotel manage facilities which are F&B,Business Centre and Laundry. 15% discount on Spa or massage from regular prices at THANN Sanctuary spa. T&C: Offer period: Now until 31st October 2015. Flash Flexible Room Only with Free Wifi in Chatrium Hotel Riverside Bangkok, Thailand. Flash Flexible Room Only with Free Wifi in Chatrium Hotel Riverside Bangkok, Thailand. Stay your way with our Fully Flexible Room rates. You�ll receive a wide range of exclusive privileges including free wifi and lots more. Offer includes: Room Only with Free WiFi. Welcome assorted seasonal fruits. Welcome drink voucher up to 2 registered guests, eligible to use at all available Food & Beverage restaurants, i.e., Lobby Lounge, Pool Bar, Silver Waves, River Barge for either non alcohol and specific alcohol drinks excluding wines, champagnes and other imported drinks. F&B Baht 500 credit once per stay per room can be used as a cash rebate for all the services, i.e., Room charge, Food & Beverage charge, Minibar charge, Business Center and all other managed services by the hotel. T&C: Offer period: Now until 31st October 2015. Flash Deal Room Only with Complimentary Eifi in Chatrium Hotel Royal Lake, Yangon, Myanmar. Flash Deal Room Only with Complimentary Eifi in Chatrium Hotel Royal Lake,Yangon, Myanmar. Be sure to grab this Flash Deal at Chatrium Hotel Royal Lake Yangon to get the most out of your stay with us. Not only will you make great savings on your booking, you�ll also receive a wide range of exclusive privileges crafted for your indulgence. Offer includes: Welcome fruit and fruit plate replenished daily and flower on arrival. Complimentary in room WiFi. 4 bottles of drinking water. USD 17 per room per stay, only eligible to be used on chargeable Hotel managed facilities of F&B, Business Centre, Minibar and Laundry. 20% discount on Spa or massage from the regular price at Nemita Spa. 5% discount on Food & Beverage. 10% discount on Buffet dinner at The Emporia Restaurant. Welcome drink upon arrival. T&C: Offer period: now until 31st October 2015. One night accommodation will be charged as a penalty if the reservation is no show or the booking is cancelled less than 24 hours prior to the day of arrival. Specials Room Only Plus 15% Discount on Spa. Specials Room Only Plus 15% Discount on Spa with Chatrium, Maitria Hotel Sukhumvit 18, Bankok, Thailand. Stay in style with the Fully Flexible Room, grocery shopping service, 2 welcome cans of beer, plus 15% discount on spa treatments at Thann Sanctuary and more. Offer includes: In room WiFi. 2 bottles of water replenished daily. Welcome 2 cans of local beer provided in the room. 15% discount on Spa or massage from the regular price at Thann Spa at Emporium Suites by Chatrium. Eco friendly amenities. In room Coffee & Tea facilities replenished daily. Grocery shopping service. Personalised services by Maitria Host ID Required. T&C: Offer period: Now until 31st October 2015. Get 10% Discount on Buffet Dinner!! Get 10% Discount on Buffet Dinner and Complimentary wifi in Chatrium Hotel Royal Lake, Yangon, Myanmar. Take advantage of this remarkable Hot Sale promotion and receive exclusive rates for your stay. Offer includes: Daily full breakfast for 2 persons. Complimentary in room WiFi. Welcome fruit and fruit plate replenished daily and flower on arrival. 4 bottles of drinking water. USD 17 per room per stay, only eligible to be used on chargeable Hotel managed facilities of F&B, Business Centre, Minibar and Laundry 20% discount on Spa or massage from the regular price at Nemita Spa. 5% discount on Food & Beverage. 10% discount on Buffet dinner at The Emporia Restaurant. Welcome drink upon arrival. T&C: Offer period: Now until 31st October 2015. Hot Deal : Get Complimentary in Room Wifi & 15% Discount on Spa in Compass Emporium Suites Bangkok. Hot Deal : Get Complimentary in Room Wifi & 15% Discount on Spa in Compass Emporium Suites Bangkok. Emporium Suites by Chatrium presents elegant luxury living and unparalleled convenience downtown in one of Bangkok�s most prestigious areas. Offer includes: Complimentary in room WiFi. Welcome drink upon arrival. THB 500 per room per stay, only eligible to be used on the chargeable facilities of only F&B, Business Centre, Laundry. 15% discount on Spa or massage from the regular price at Thann Spa. T&C: Offer period: Now until 31st October 2015. Family Deal Room Only with Complimentary wifi and 25% discount on Spa in Chatrium Residence Sathon, Bangkok, Thailand. Stay with the family and enjoy exclusive privileges to ensure your stay is nothing short of remarkable. Receive a complimentary wifi in room and amazing discounts in spa, laundry, and restaurants, THB 500 to spend within the Residence and more. Offer includes: Room only. Complimentary in room Wi Fi. Welcome drink upon arrival. THB 500 per room per stay, only eligible to be used on chargeable facilities, i.e., F&B, Business Centre, Laundry, etc. Free daily shuttle van service to Chongnonsee Skytrain Station, Emporium Shopping Complex, Central Shopping Complex. 25% discount on Spa or massage from the regular price. 10% discount on laundry & dry cleaning. 10% discount at restaurants. T&C: Offer period: Now until 31st October 15. Get Complimentary in Room Wifi with Chatrium Hotel Royal Lake Yangon, Myanmar. Get Complimentary in Room Wifi with Chatrium Hotel Royal Lake Yangon, Myanmar. Take advantage of this amazing Hot Sale in Chatrium Yangon one of the city�s topmost hotels for pure luxury and rich colonial style heritage. Offer includes: Daily full breakfast for 2 persons. Complimentary in room WiFi. Welcome fruit and fruit plate replenished daily and flower on arrival. 4 bottles of drinking water. T&C: Offer period: Now until 31st October 2015. Book Now. Use promo code: SUMCHRY. Get 15% Discount in Spa or Massage with Specials Room!! Get 15% discount in Spa or Massage with Specials Room only promotion in Maitria Hotel Sukhumvit, Bangkok, Thailand. Enjoy your holidays out with Specials Room Only package in the luxurious Maitria Hotel Sukhumvit 18, offers cozy serviced apartments with full kitchens and a large sitting area. It has a pool, a rooftop putting green and a fully equipped fitness center. Package includes: In room WiFi. 2 bottles of water replenished daily. Welcome 2 cans of local beer provided in the room. 15 % discount on Spa or massage from the regular price at Thann Spa at Emporium Suites by Chatrium. Eco friendly amenities. T&C: Offer period: Now until 31st October 2015. Flash Deal Room Only - Chatrium Hotel Royal Lake,Yangon, Myanmar. Flash Deal Room Only with Complimentary Wi-Fi in Chatrium Hotel Royal Lake,Yangon, Myanmar. Be sure to grab this Flash Deal at Chatrium Hotel Royal Lake Yangon to get the most out of your stay with us. Not only will you make great savings on your booking, you�ll also receive a wide range of exclusive privileges crafted for your indulgence. Offer includes: Welcome fruit and fruit plate replenished daily and flower on arrival. Complimentary in room WiFi. 4 bottles of drinking water. USD 17 per room per stay, only eligible to be used on chargeable Hotel managed facilities of F&B, Business Centre, Minibar and Laundry. 20% discount on Spa or massage from the regular price at Nemita Spa. 5% discount on Food & Beverage. 10% discount on Buffet dinner at The Emporia Restaurant. Welcome drink upon arrival. T&C: Offer period: now until 31st October 2015. One night accommodation will be charged as a penalty if the reservation is no show or the booking is cancelled less than 24 hours prior to the day of arrival. Book Now. Get Up To 15% Off in Spa or Massage: Maitria Hotel Sukhumvit 18, Bangkok, Thailand. Get Up To 15% Off in Spa or Massage: Maitria Hotel Sukhumvit 18, Bangkok, Thailand. Maitria Specials Room Only. In room WiFi. 2 bottles of water replenished daily. Welcome 2 cans of local beer provided in the room. 15 % discount on Spa or massage from the regular price at Thann Spa at Emporium Suites by Chatrium. Eco friendly amenities. In room Coffee & Tea facilities replenished daily. Grocery shopping service. Personalised services by Maitria Host. T&C: Offer period: Now until 31st October 2015. Book Now. Special Campaign with Chatrium. Book and save with our limited time offer. Receive a wide range of exclusive privileges including in room WiFi, THB 500 per room per stay, fully flexible dates, early check in, late check out and more. Package Inclusions:- Welcome assorted seasonal fruits. Welcome drink voucher up to 2 registered guests, eligible to use at all available Food & Beverage restaurants, i.e., Lobby Lounge, Pool Bar, Silver Waves, River Barge for either non-alcohol and specific alcohol drinks (excluding wines, champagnes and other imported drinks). In-room Wi-Fi and wired Internet access. Daily scheduled Shuttle Boat Service between hotel and Taksin Pier. Light and Easy Luggage Service, travel light and make it easy on yourself when travelling to many of Thailand�s resorts by allowing us to take care of your main luggage with our compliments during your pre and post stay at Chatrium Hotel Riverside Bangkok. T&C: This offer is valid from now - 31 October 2016 with the blackout dates from 29 December 2015 01 January 2016. Book Now. Your Summer Selfie Package with Chatrium Hotel Riverside Bangkok. Selfie�s are a fun and memorable way to capture your photos while on holiday. With this special package we�ll include a Selfie Stick with each room booking so that you can snap the perfect shots of yourself, friends and family. Package Inclusions:- Complimentary hand-held selfie stick with the recommended attractions. Welcome assorted seasonal fruits. Welcome drink voucher up to 2 registered guests, eligible to use at all available Food & Beverage restaurants, i.e., Lobby Lounge, Pool Bar, Silver Waves, River Barge for either non-alcohol and specific alcohol drinks (excluding wines, champagnes and other imported drinks). In-room Wi-Fi and wired Internet access. Daily scheduled Shuttle Boat Service between hotel and Taksin Pier. T&C: This offer is valid from now until 31 October 2016 with the blackout dates from 29 December 2015 01 January 2016. Minimum of 2 nights is required. Book Now. Simply Recharge with Chatrium Hotel River Side Bangkok. Ideal for those who are always on the go and connected to their smart devices, this package offers one power bank per room per stay. You�ll also receive in room WiFi, THB 500 per room per stay, early check in, late check out and more. Package Inclusions:- Complimentary 1 Power Bank per room per stay. Welcome assorted seasonal fruits. In-room Wi-Fi and wired Internet access. Welcome drink voucher up to 2 registered guests, eligible to use at all available Food & Beverage restaurants, i.e., Lobby Lounge, Pool Bar, Silver Waves, River Barge for either non-alcohol and specific alcohol drinks (excluding wines, champagnes and other imported drinks). Daily scheduled Shuttle Boat Service between hotel and Taksin Pier. Light and Easy Luggage Service, travel light and make it easy on yourself when travelling to many of Thailand�s resorts by allowing us to take care of your main luggage with our compliments during your pre and post stay at Chatrium Hotel Riverside Bangkok. T&C: This offer is valid from now to 31st October 2016 with the blackout dates from 29 December 2015 01 January 2016. Minimum of 2 nights is required. Book Now. Hot Deal Room Only @ Emporium Suites Bangkok. We understand even though you carefully plan your trip, travel plan may sometimes need to change. Enjoy fully flexibility to amend your travel dates and should it be absolutely nescessary, even cancel your trip up to 24 hours prior to arrival. Package Inclusions: Welcome fruits upon arrival. Complimentary in room Wi Fi and Internet access 1 IP/user/per stay. Welcome drink upon arrival. T&C: This offer is valid from 11 March 2015 31 October 2016. Fully Flexible Room Only @ Chatrium! Fully Flexible Room Only @ Chatrium! For guests who know exactly when you will travel and you need a good nights sleep in a great room with free WiFi, our Chatrium Fully Flexible Room Only is for you at Chatrium Residence Sathon Bangkok. Package Includes: Complimentary in room Wi Fi and wired Internet access. Usage of Fitness Centre, Sauna and Jacuzzi. Affilired Flash Deal Room Only @ Chatrium!! Affilired Flash Deal Room Only @ Chatrium. Package Inclusions: Welcome fruit and fruit plate replenished daily and flower on arrival. Complimentary in room WiFi. 4 bottles of drinking water. One night accommodation will be charged as a penalty if the reservation is no show or the booking is cancelled less than 24 hours prior to the day of arrival. Additional benefits from now - 31 December 2015. USD 17 per room per stay, only eligible to be used on chargeable Hotel managed facilities of F&B, Business Centre, Minibar and Laundry. Guaranteed early check in from 11 am and late check out until 3 pm. 20% discount on Spa or massage from the regular price at Nemita Spa. 5% discount on Food & Beverage. 10% discount on Buffet dinner at The Emporia Restaurant. Welcome drink upon arrival. Fully Flexible Room Only @ Chatrium Hotel Riverside Bangkok. Fully Flexible Room Only @ Chatrium Hotel Riverside Bangkok. ***Songkran Survival Kit 2 Sets of water gun and water proof bag per room per stay provided for during 12 16 April 2015 Minimum 2 nights stay***. Package Inclusions : Room Only with Free WiFi. Welcome drink upon arrival. Additional Benefits : THB 500 per room per stay, only eligible to be used on the chargeable Hotel managed facilities of F&B, Business Centre, Minibar and Laundry. Guaranteed Early check in from 1100 am or 1100 hrs. Guaranteed Late check out until 0300 pm or 1500 hrs. This early check in and late check out are NOT eligible and NOT applicable to the following festive periods of : Christmas and New Year from 23 December 15 3 January 2016. Valentines Days from 13 15 February 2016. Chinese New Year from 6 11 February 2016. Affilired Maitria Specials Room Only! Affilired Maitria Specials Room Only! In room WiFi. 2 bottles of water replenished daily. Welcome 2 cans of local beer provided in the room. 15 % discount on Spa or massage from the regular price at Thann Spa at Emporium Suites by Chatrium. Eco friendly amenities. In room Coffee & Tea facilities replenished daily. Grocery shopping service. Personalised services by Maitria Host. Book Now. Affilired Fully Flexible Room Only @ Chatrium!! Affilired Fully Flexible Room Only @ Chatrium. Package Inclusions : Room only. Complimentary in room Wi Fi. Welcome drink upon arrival. Additional benefits : THB 500 per room per stay, only eligible to be used on chargeable facilities, i.e., F&B, Business Centre, Laundry, etc. Guaranteed early check in from 11.00 am or 11.00 hrs. Guaranteed late check out until 03.00 pm or 15.00 hrs. Free daily shuttle van service to Chongnonsee Skytrain Station, Emporium Shopping Complex, Central Shopping Complex. 25% discount on Spa or massage from the regular price. 10% discount on laundry & dry cleaning. 10% discount at restaurants. This early check in and late check out are NOT applicable to the following period : Christmas and New Year from 23 December 15 - 3 January 2016. Chinese New Year from 6 11 February 2016. Affilired Flash Deal Room Only @ Chatrium!! Package inclusions : Complimentary in room WIFI. Welcome drink upon arrival. Addition Benefits : THB 500 voucher per room per stay, only eligible to be used on Hotel manage facilities which are F&B,Business Centre and Laundry. 15% discount on Spa or massage from regular prices at THANN Sanctuary spa. Guaranteed early check in from 11:00am. Guaranteed late check out until 15:00pm. This early check in and late check out are NOT eligible and NOT applicable to the following festive period of : Christmas and New year from 25 December 2015 5 January 2016. Chinese new year from 6 11 February 2016. Chatrium Hotel Riverside Bangkok! Easter Special Room Only @ Chatrium. Room Only with Free WiFi. Welcome drink upon arrival. Free THB 500 credit per room per stay. Early check in and late check out Early check in and late check out. T&C: No cancellation and changes are allowed. Full Non refundable prepayment of the whole period is required upon the booking confirmation. Booking period 17 February - 30 April 2015. Period of stay 15 March 2015 - 30 April 2015. Book Now. Chatrium Residence Sathon Bangkok! Easter Special Room Only @ Chatrium POS. Complimentary WiFi. Welcome drink upon arrival. THB 500 per room per stay, only eligible to be used on chargeable facilities, i.e., F&B, Business Centre, Laundry, etc. Early check in and late check out subject to the room availability upon check in and check out. Free daily shuttle van service. T&C: Reservations must be cancelled 1 day prior to arrival to avoid a penalty of nights room and tax or for no show 1 night charge applies. Booking period 17 February - 30 April 2015. Period of stay 15 March 2015 - 30 April 2015. Book Now. Maitria Hotel Sukhumvit 18! Easter Special Room Only @ Maitria. Save up to 68%. In room WiFi. 2 bottles of water replenished daily. Welcome 2 cans of local beer provided in the room. T&C: No cancellation and changes are allowed. Booking period 17 February - 30 April 2015. Period of stay 15 March 2015 - 30 April 2015. Book Now. Emporium Suites by Chatrium!! Easter Special Room Only @ Emporium Suites. Complimentary in room WiFi. Welcome drink upon arrival. THB 500 per room per stay, Early check in and late check out. T&C: No cancellation and changes are allowed. Booking period 17 February - 30 April 2015. Period of stay 15 March 2015 - 30 April 2015. Limited time Deal @ Emporium Suites! Limited time Deal @ Emporium Suites! Limited time only! Book now for a room with special rate including 5 star accommodation, remarkable service and many more benefits. Package Includes: Welcome fruits upon arrival. Complimentary in-room Wi-FI and Internet access 1 IP/user/per stay. Late check-out (Subject to room availability). Book Now. Business Traveller Package @ Emporium Suites. Business Traveller Package @ Emporium Suites. Enjoy a sumptuous complimentary breakfast with airport transfer and other extensive benefits under this Business Traveller Package at Emporium Suites by Chatrium. Package Includes: Daily buffet breakfast up to 2 registered guests. Complimentary in room WiFi and wired internet access 2 IP / user / stay. One way airport transfer by BMW Series 5. Guaranteed Room Upgrade to Deluxe room. Daily Sky Train Pass for 2 persons (Unlimited journeys) will be given by our Concierge one day after the check in date, please contact our Concierge for more detail accordingly. Welcome fruits on arrival. 10% discount coupon Siam Paragon, Emporium Mall. 15% discount for Thann Spa. Once cocktail drink at Lobby Lounge on daily basis. Up to 30% discount voucher at Siam Ocean World and Madame Tussauds Bangkok. Book Now. Early Saver @ Chatrium. Plan your holiday or business trip early to take advantage of Chatrium�s remarkable Early Saver rates at Chatrium Hotel Riverside Bangkok. Package Includes: Daily buffet breakfast up to 2 registered guests. In-room Wi-Fi and wired Internet access. Daily scheduled Shuttle Boat Service between hotel and Taksin Pier. Book Now. Early Saver 7 Days With Breakfast @ Maitria. Early Saver 7 Days With Breakfast @ Maitria. Rate inclusions: Daily buffet breakfast. In-room Wi-Fi and wired Internet access. Eco-friendly amenities. In-room Coffee & Tea facilities. Personalized services by Matria Host. Grocery shopping service. Book Now. Fully Flexible Room Only @ Chatrium. Fully Flexible Room Only @ Chatrium. For guests who know exactly when you will travel and you need a good night�s sleep in a great room with free WiFi, our Chatrium Fully Flexible Room Only is for you at Chatrium Residence Sathon Bangkok! Package Includes: Complimentary in-room Wi-Fi and wired Internet access. Usage of Fitness Centre, Sauna and Jacuzzi. Complimentary daily shuttle van service to Chongnonsee Sky Train Station on Sathorn Road, Emporium Shopping Complex, Promphong Sky Train Station and Central Rama III Shopping Complex. Book Now. Stay Longer 3 Nights Room Only!! Stay Longer 3 Nights Room Only!! Rate inclusions: In-room Wi-Fi and wired Internet access. Eco-friendly amenities. In-room Coffee & Tea facilities. Personalized services by Matria Host. Grocery shopping service. Book Now. Family of 3 With Upgrade @ Chatrium. Family of 3 With Upgrade @ Chatrium. For either friends or family who will travel and need a good nights sleep together in a great room with breakfast the next morning, our special package, Family of 3 is here for you. Package Includes: Complimentary daily buffet breakfast up to 3 registered guests Complimentary room upgrade to Grand Suite 1 Bedroom. A single bed comes in a form of Rollaway Bed in this package. In-room Wi-Fi and wired Internet access. Daily scheduled Shuttle Boat Service between hotel and Taksin Pier. Flash Sale @ Chatrium! Enjoy our room for guests who know exactly when they will travel and need a good nights sleep in a great room, our Flash Sale is for you. Package Includes: In room Wi Fi and wired Internet access Daily scheduled Shuttle Boat Service between hotel and Taksin Pier. Affilired Emporium Suites Hot Deal Complimentary in room WiFi Welcome drink upon arrival THB 500 per room per stay, only eligible to be used on the chargeable facilities of only F&B, Business Centre, Laundry 15% discount on Spa or massage from the regular price at Thann Spa. Book Now. Fully Flexible Room Only @Chatrium!! Fully Flexible Room Only @ Chatrium!! Complimentary WiFi Welcome drink upon arrival. THB 500 per room per stay, only eligible to be used on chargeable facilities, i.e., F&B, Business Centre, Laundry, etc. Free daily shuttle van service to Chongnonsee Skytrain Station, Emporium Shopping Complex, Central Shopping Complex. 25% discount on Spa or massage from the regular Price. 10% discount on laundry & dry cleaning. 10% discount at restaurants. Hot Sale @ Chatrium Yangon!! Hot Sale @ Chatrium Yangon!! Daily full breakfast for 2 persons. Complimentary in room WiFi. Welcome fruit and fruit plate replenished daily and flower on arrival. 4 bottles of drinking water. Book Now. Affilired Maitria Specials Room Only Maitria Hotel Sukhumvit 18! Affilired Maitria Specials Room Only Maitria Hotel Sukhumvit 18. Affilired Maitria Specials Room Only : In Room WiFi. 2 bottles of water replenished daily. Welcome 2 cans of local beer provided in the room. 15 % discount on Spa or massage from the regular price at Thann Spa at Emporium Suites by Chatrium. Eco friendly amenities. Affilired Limited Time Offer @Chatrium Riverside. Chatrium Hotel Riverside Bangkok, a five star hotel located by the Chao Phraya River with spacious and huge rooms & suites, plus great views of the city. Reservations must be cancelled at least 24 hours prior to the arrival date to avoid a penalty. Late cancellation or no show is subject to 1 night accommodation charge and taxes. Early Saver @Chatrium Take 13% Off!! Early Saver @Chatrium Take 13% Off!! Plan your holiday or business trip early to take advantage of Chatriums remarkable Early Saver rates with up to 13% savings at Chatrium Hotel Riverside Bangkok. Package Includes: Daily buffet breakfast up to 2 registered guests. In room Wi Fi and wired Internet access. Daily scheduled Shuttle Boat Service between hotel and Taksin Pier. Book Now. Fully Flexible Room Only @ Chatrium!! Fully Flexible Room Only @ Chatrium! For guests who know exactly when you will travel and you need a good nights sleep in a great room with free WiFi, our Chatrium Fully Flexible Room Only is for you at Chatrium Residence Sathon Bangkok. Package Includes: Complimentary in room Wi Fi and wired Internet access. Usage of Fitness Centre, Sauna and Jacuzzi. Complimentary daily shuttle van service to Chongnonsee Sky Train Station on Sathorn Road, Emporium Shopping Complex, Promphong Sky Train Station and Central Rama III Shopping Complex. Book Now. Emporium Suites Hot Deal Get 63%!! Emporium Suites Hot Deal Get 63%!! Emporium Suites by Chatrium presents elegant luxury living and unparalleled convenience downtown in one of Bangkoks most prestigious areas. Complimentary in room WiFi. Welcome drink upon arrival. THB 500 per room per stay, only eligible to be used on the chargeable facilities of only F&B, Business Centre, Laundry. Early check in and late check out subject to the room availability upon check in and check out. 15% discount on Spa or massage from the regular price at Thann Spa. Book Now. Affilired Maitria Specials Room Only Maitria Hotel Sukhumvit 18!! Affilired Maitria Specials Room Only Maitria Hotel Sukhumvit 18!! Affilired Maitria Specials Room Only : In room WiFi. 2 bottles of water replenished daily. Welcome 2 cans of local beer provided in the room. 15 % discount on Spa or massage from the regular price at Thann Spa at Emporium Suites by Chatrium. Eco friendly amenities. Book Now. Take Hot Sale @Chatrium Yangon!! Take Hot Sale @Chatrium Yangon!! Daily full breakfast for 2 persons. Complimentary in room WiFi. Welcome fruit and fruit plate replenished daily and flower on arrival. 4 bottles of drinking water. Use promo code: SUMCHRY. Book Now. Chinese Holidays@Chatrium. Enjoy a remarkable night in any of our rooms or suites and in the morning, enjoy a sumptuous complimentary breakfast at Chatrium Hotel Royal Lake Yangon. Package Includes: Complimentary daily buffet breakfast for up to 2 registered guests at The Emporia. Welcome fruits and flower on arrival. Complimentary in room Wi Fi or wired Internet access 1 IP per unit valid for 4 devices. 5% Discount for Food and Beverage non alcohol. Book Now. 5 Days Deal@Chatrium!! Enjoy a remarkable night in any of our rooms or suites and in the morning, enjoy a sumptuous complimentary breakfast at Chatrium Hotel Royal Lake Yangon. Package Includes: Complimentary daily buffet breakfast for up to 2 registered guests at The Emporia. Welcome fruits and flower on arrival. Complimentary in room Wi Fi or wired Internet access 1 IP per unit valid for 4 devices. 5% Discount for Food and Beverage non alcohol. Book Now. Get Up To 68% Discount On Your Booking With Maitria Hotel! Get Up To 68% Discount On Your Booking With Maitria Hotel. Maitria Hotel Sukhumvit 18 A Chatrium Collection is a modern lifestyle hotel in the downtown district of Bangkok, right next to some of the city best shopping and dining hotspots. Maitria is all about comfort, culture and connectivity, making sure that smart and independent traveller’s enjoy the most of their time with us. Emporium Suites Early Saver! Enjoy our room for guests who know exactly when they will travel and need a good nights sleep in a great room, our Fully Flexible is for you. Package Includes: Welcome fruits upon arrival. Complimentary daily buffet breakfast for up to 2 registered guests. Complimentary in room Wi Fi and wired Internet access 1 IP/user/per stay. Remarkable Spa Chatrium Residence Sathon Bangkok! Remarkable Spa Chatrium Residence Sathon Bangkok. For spa lovers, do go with Remarkable Spa @ Chatrium that provides a rejuvenating Spa Massage for two persons at Chatrium Residence Sathon Bangkok. Package Includes: Daily buffet breakfast for up to 2 registered guests. Complimentary in-room Wi-Fi and wired Internet access (maximum 2 IPs). Complimentary non-alcoholic minibar beverages with limited items. One Swedish or East Meet West massage for up to 2 registered guests (once per stay). Complimentary local calls (with 02 only). Up to 30% discount voucher at Siam Ocean World and Madame Tussauds Bangkok. Solo Traveler Special@Chatrium. Enjoy a remarkable night in any of our rooms or suites and in the morning, enjoy a sumptuous complimentary breakfast under this Solo Traveler Special at Chatrium Hotel Royal Lake Yangon. Package Includes: Complimentary daily buffet breakfast up to 1 registered guests at The Emporia. Complimentary in room Wi Fi or wired Internet access 1 IP per unit valid for 4 devices. 5% Discount voucher for Food & Beverage Non Alcohol. Dash in & Out @ Chatrium Hotel Riverside Bangkok! Dash in & Out @ Chatrium Hotel Riverside Bangkok. Looking for a convenient and effortless stay? Then our Dash IN & OUT package is something you really should take advantage of. Inclusive of one way airport transfer for your easy convenience at Chatrium Hotel Riverside Bangkok. Package Inclusions: Daily buffet breakfast up to 2 registered guests. Complimentary in-room Wi Fi and wired internet access. One way airport transfer by BMW 5 Series. Complimentary daily replenishment of non-alcoholic minibar beverages. Chatrium Club Lounge privileges for guests who choose to stay in a Chatrium Club Room or Suite. Daily scheduled Shuttle Boat Service between hotel and Taksin Pier. Room upgrade from City View to River View (applicable only to the room types of Grand Room and Grand Suite 1 Bedroom). Up to 30% discount voucher at Siam Ocean World and Madame Tussauds Bangkok. Emporium Suites Weekend Getaway! An escapade within the city over the weekend, to relax and unwind away from home in the comfort of luxury and elegance at Emporium Suites by chatrium. Package Includes: Complimentary daily buffet breakfast for up to 2 registered guests. Welcome fruits upon arrival. Complimentary in-room Wi-Fi and wired Internet access 1 IP/user/per stay. Emporium Suites Hot Deal! For guests needing just the room with no frills, our room with Wi Fi is the perfect fit for you. Come and stay hassle free and save up to 59% at Emporium Suites by Chatrium. Package Includes: Welcome fruits upon arrival. Complimentary in-room Wi-FI and Internet access 1 IP/user/per stay. Late check-out (Subject to room availability). Senior Citizen @ Chatrium! Plan your holidays or business trip and take advantage of Chatrium’s remarkable rates for our Senior Citizen clients, with 60% savings at Chatrium Residence Sathon Bangkok. Package Includes: Daily buffet breakfast for up to 2 registered guests. Baht 200 F&B voucher per stay per room. Complimentary in-room Wi-Fi and wired Internet access. Welcome fruits and flowers in the room. Early check-in at 8 am and late check-out at 8 pm. Daily scheduled shuttle service to BTS & MRT station, as well as shopping mall. Thai Residents & Expat Local Special @ Chatrium! Thai Residents & Expat Local Special @ Chatrium. Thai Residents and expatriates working in Thailand get to enjoy our special rates at Chatrium Residence Sathon Bangkok. Package Includes: Complimentary daily buffet breakfast for up to 2 registered guests. Baht 200 F&B voucher per stay per room maximum 2 vouchers per room. Complimentary in room Wi Fi and wired Internet access maximum 2 IPs. Complimentary usage of Fitness Centre, Sauna and Jacuzzi. 10% discount on food & beverage at the hotel restaurant. School Holiday Break @ Chatrium!! School Holiday Break @ Chatrium!! Travelling for the whole family during school holiday? Here are something you really should take advantage of… at Chatrium Residence Sathon Bangkok. Package Includes: 10% discount on food & beverage at the hotel restaurant. 10% discount on laundry and dry cleaning services. 30% discount on spa and massage treatments at Green Leaf Spa. Fully Flexible Room only @ Chatrium Sathon! Fully Flexible Room only @ Chatrium Sathon. For guests who know exactly when you will travel and you need a good nights sleep in a great room with free WiFi, our Chatrium Fully Flexible Room Only is for you at Chatrium Residence Sathon Bangkok. Package Includes: Baht 200 F&B voucher per stay per room. Complimentary in room Wi Fi and wired Internet access. Usage of Fitness Centre, Sauna and Jacuzzi. 30% discount on spa and massage treatments at Green Leaf Spa. Complimentary daily shuttle van service to Chongnonsee Sky Train Station on Sathorn Road, Emporium Shopping Complex, Promphong Sky Train Station and Central Rama III Shopping Complex. Limited Time Offer @ Chatrium Riverside. Limited Time Offer @ Chatrium Riverside. Chatrium Hotel Riverside Bangkok, a five star hotel located by the Chao Phraya River with spacious and huge rooms & suites, plus great views of the city.Full non refundable prepayment of the whole period of stay is required when the reservation is confirmed. Remarkable Deal @ Emporium Suites! Remarkable Deal @ Emporium Suites! Package detail : Complimentary daily buffet breakfast for up to 2 registered guests. Welcome fruits upon arrival. Complimentary in room Wi Fi and wired Internet access 1 IP / User / Per stay. Besides all the above benefits included in this room rate, the below benefits are also additionally eligible to any reservations that are booked/made only from our Chatrium.com website. The below benefits are not applicable to any other bookings that are made from other third party channels. Welcome drink upon arrival. Late check outSubject to room availability upon check in. 3 complimentary pieces of regular laundry/pressing per day per room. Baht 300 Minibar credit per stay per room. 67% Discount @Chatrium Riverside!! 67% discount from BAR rate with daily breakfast and in room WiFi. With the River of Kings welcoming you at our doorstep, followed by a warm smile at the door, you ll always be starting off on the right note at Chatrium Hotel Riverside Bangkok our 5 star hotel by Chao Phraya River. Take 62% Discount @Chatrium Sathon!! Take 62% Discount @Chatrium Sathon!! 62% discount from BAR rate with in room WiFi no breakfast is included. In a vibrant city like Bangkok, sometimes all you want is a sanctuary of calm to call your own. At Chatrium Hotel Sathon Bangkok, you will get just that. Get 38% Discount @Chatrium Hotel Royal Lake Yangon!! Get 38% Discount @Chatrium Hotel Royal Lake Yangon!! Experience the splendor of a bygone era with a stay in our colonial style Chatrium Royal Lake Yangon hotel, our 5 star hotel featuring exquisite views of the magnificent Shwedagon Pagoda, crown jewel of Myanmar. 38% discount from BAR rate with daily breakfast and in room WiFi. Business Traveller Package @ Emporium Suites! Business Traveller Package @ Emporium Suites! Enjoy a sumptuous complimentary breakfast with airport transfer and other extensive benefits under this Business Traveller Package at Emporium Suites by Chatrium. Package Inclusions: Daily buffet breakfast up to 2 registered guests. Complimentary in-room WiFi and wired internet access (2 IP/user/stay). One-way airport transfer by BMW Series 5. Guaranteed Room Upgrade to Deluxe room. Daily Sky Train Pass for 2 persons (Unlimited journeys) will be given by our Concierge one day after the check in date, please contact our Concierge for more detail accordingly. Welcome fruits on arrival. 10% discount coupon Siam Paragon, Emporium Mall. 15% discount for Thann Spa. Once cocktail drink at Lobby Lounge on daily basis.Up to 30% discount voucher at Siam Ocean World and Madame Tussauds Bangkok. Thai Resident & Local Expat Specials @ Emporium! Thai Resident & Local Expat Specials @ Emporium! Try out our Exclusive specials for Thai Residents and Expatriates working in Thailand at Emporium Suites by Chatrium! Package Includes: Welcome fruits upon arrival. Complimentary in room Wi Fi and Internet access 1 IP/user/per stay. Early Spring @ Chatrium!! Spring is coming . Book your room with no frills, our room with Wi Fi is the perfect fit for you. Come and stay hassle free at Chatrium Residence Sathon Bangkok. Daily shuttle van service to BTS sky train, Emporium Shopping Complex, Central Shopping Complex. Complimentary in room Wi Fi and wired Internet access. Maximum 2 IPs in Deluxe Studio. Maximum 2 IPs in Deluxe One Bedroom. Maximum 4 IPs in Deluxe Two Bedroom. Maximum 4 IPs in Deluxe Three Bedroom. Easter Holidays @ Chatrium. Enter promo code: FESTCRST. More Daily full breakfast for 2 persons. Complimentary in room WiFi. Welcome drink upon arrival. Baht 500 Minibar allowance per room per stay. Daily 3 pieces of regular laundry or pressing per room. Late check out subject to availability. Book Now. Easter Holiday @ Chatrium! Daily full breakfast for 2 persons. Complimentary in room WiFi. Welcome drink upon arrival. Baht 500 Food & Beverage allowance per room per stay. Daily 3 pieces of regular laundry or pressing per room. Late check out subject to availability. Enter coupon code: FESTCHRB. Book Now. Easter Holidays @ Emporium Suites! Easter Holidays @ Emporium Suites! Daily full breakfast for 2 persons. Complimentary in room WiFi. Welcome drink upon arrival. Baht 300 Minibar allowance per room per stay. Daily 3 pieces of regular laundry or pressing per room. Late check out subject to availability. Book Now. Chatrium Residence Sathon Bangkok - Take 68%!! Chatrium Residence Sathon Bangkok - Take 68%!! Offer Description: 30% discount at Green Leaf Spa. 10% discount on laundry & dry cleaning. 20% discount at restaurants. More In a vibrant city like Bangkok, sometimes all you want is a sanctuary of calm to call your own. At Chatrium Hotel Sathon Bangkok, you’ll get just that. At our 4 star hotel you can enjoy the picturesque oasis of calm with our oversized free-form swimming pool set amongst lush greenery. Coupled with our warm and welcoming hospitality, Chatrium Residence Sathon Bangkok is truly your home away from home, a personal retreat for your soul. Hot Deal - 62% @ Emporium Suites!! Hot Deal - 62% @ Emporium Suites!! Offer Description: Daily full breakfast for 2 persons. Complimentary in room WiFi. Welcome drink upon arrival. THB 300 Minibar credit per room per stay. Daily 3 pieces of regular laundry or pressing per room. More Apart from the familiar homely service you’ve come to expect from us, our Emporium Suites by Chatrium is served with icing on top of the cake—a luxurious lifestyle at a remarkable address. Emporium suites by Chatrium is a 5 star hotel ready to make your stay on Bangkok an unbelievable experience. Hot Deal! 25% Saving @ Chatrium Yangon. Hot Deal! 25% Saving @ Chatrium Yangon. Offer Description: Daily full breakfast for 2 persons. Complimentary in room WiFi. Welcome fruits, 4 bottles of drinking water and flower in room. Additional benefits from now - 31 March 2014. USD 15 Minibar allowance per room per stay. Daily 3 pieces of regular laundry or pressing per room. More Experience the splendor of a bygone era with a stay in our colonial-style Chatrium Royal Lake Yangon hotel, our 5 star hotel featuring exquisite views of the magnificent Shwedagon Pagoda, crown jewel of Myanmar. Festive Deal @ Chatrium Yangon! Festive Deal @ Chatrium Yangon! 20% discount from BAR with daily breakfast, late check out, WiFi, F&B Credit Baht 500 per room per stay, 3 complimentary pieces of regular laundry/pressing per day. Hot Deal Emporium Suites by Chatrium!! 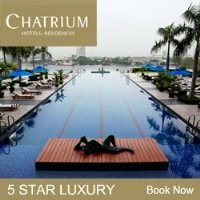 Hot Deal Emporium Suites by Chatrium!! For guests needing just the room with no frills, our room with Wi-Fi is the perfect fit for you. Come and stay hassle free and save up to 59% at Emporium Suites by Chatrium! Package Includes: Welcome drinks and fruits upon arrival. Complimentary in-room Wi-FI and Internet access 1 IP/user/per stay. Late check-out (Subject to room availability upon check in). Stay Longer & Save Chatrium Hotel Riverside Bangkok! Stay Longer & Save Chatrium Hotel Riverside Bangkok! Book 3 nights in a row in Grand Room City View and Grand Suite 1 Bedroom City View and get your accommodation upgraded automatically to a spectacular Grand Room River View or Grand Suite 1 Bedroom River View respectively! Package Includes: Daily buffet breakfast up to 2 registered guests. In-room Wi-Fi and wired Internet access. Daily scheduled Shuttle Boat Service between hotel and Taksin Pier. 15% discount at our River Barge Restaurant and Silver Waves Chinese Restaurant (Food only). Family Treats @ Emporium Suites! Family Treats @ Emporium Suites! Bookings Looking for a room for a family with 2 adults and 2 children? Look no further with our family deal with an extensive benefits …Package Inclusions: Rate based on Superior Room (twin or king beds) 2 Adults and 2 Children. Room including ABF for 2 Persons. Upgrade to next higher room category Deluxe 65 sqm. Kids breakfast Free until the age of 13 years (max 2 kids per room). One Complimentary extra bed. 10% Discount for Emporium & Siam Paragon Shopping mall. 15% Discount at Thann Spa. 20% discount on entrance fee to Siam Ocean World or Madame Tussauds per person. 30% discount if combine Madame Tussauds & Siam Ocean World and 5D Cinema per person. Late checkout upon availability. Chatrium Residence Sathon Bangkok Hot Deals!! Chatrium Residence Sathon Bangkok Hot Deals!! For guests needing just the room with no frills, our room with Wi-Fi is the perfect fit for you. Come and stay hassle-free at Chatrium Residence Sathon Bangkok! Package Includes: Daily shuttle van service to BTS sky-train, Emporium Shopping Complex, Central Shopping Complex. Complimentary in-room Wi-Fi and wired Internet access. Maximum 2 IPs in Deluxe Studio. Maximum 2 IPs in Deluxe One-Bedroom. Maximum 4 IPs in Deluxe Two-Bedroom. Maximum 4 IPs in Deluxe Three-Bedroom. Early Saver Chatrium Residence Sathon Bangkok!! Early Saver Chatrium Residence Sathon Bangkok!! Complimentary daily buffet breakfast for up to 2 registered guests. Package Includes: Complimentary in-room Wi-Fi and wired Internet access. Complimentary usage of Fitness Centre, Sauna and Jacuzzi. 10% discount on food & beverage at the hotel restaurant. 10% discount on laundry and dry cleaning services. 30% discount on spa and massage treatments at Green Leaf Spa. Daily shuttle van service to Chongnonsee Sky Train Station on Sathorn Road, Emporium Shopping Complex, Promphong Sky Train Station and Central Rama III Shopping Complex. Chatrium Hotel Royal Lake Yangon Last Minute!! Chatrium Hotel Royal Lake Yangon Last Minute!! Last minute travels? Need an Hotel in Yangon? Enjoy 23% discount for this last minute booking package. Book within 3 days from the day you make a booking to enjoy a remarkable stay with Chatrium Hotel Royal Lake Yangon. Package Inclusions: Complimentary daily buffet Breakfast (or) Japanese Set Breakfast via Room Service. Complimentary in-room Wi-Fi or wired internet access 2 IPs per unit. Late check-out until 0500 pm (subject to room availability). Welcome fruits and flowers in the room. Complimentary MiniBar replenished daily during the stay (2 cans of Beer, 2 cans of soft drink, 4 bottles of drinking water). 10% discount on Food & Beverage at all our restaurants.